Bluetooth information appears in Settings, Devices right at the top of the list. Bluetooth is a wireless system that's ideal for keyboards, mice, and other short-range, low-data uses. It's great for connecting all kinds of devices to PCs wirelessly. Bluetooth got its name from the tenth-century Danish king Harald Bluetooth who united fractious, often-warring Danish tribes into a single, unified kingdom. The idea is that Bluetooth delivers common, united (and simple) short-range wireless communication. Fortunately, one need know nearly nothing technical to make Bluetooth work on a Windows PC. If Bluetooth is present in Windows 10, it shows up in Settings, under the heading of Bluetooth and other devices. The screenshot (above) is the settings screen you're likely to see. Wait... What If There's No Bluetooth Present? The absence of a Bluetooth entry means no Bluetooth on this PC. 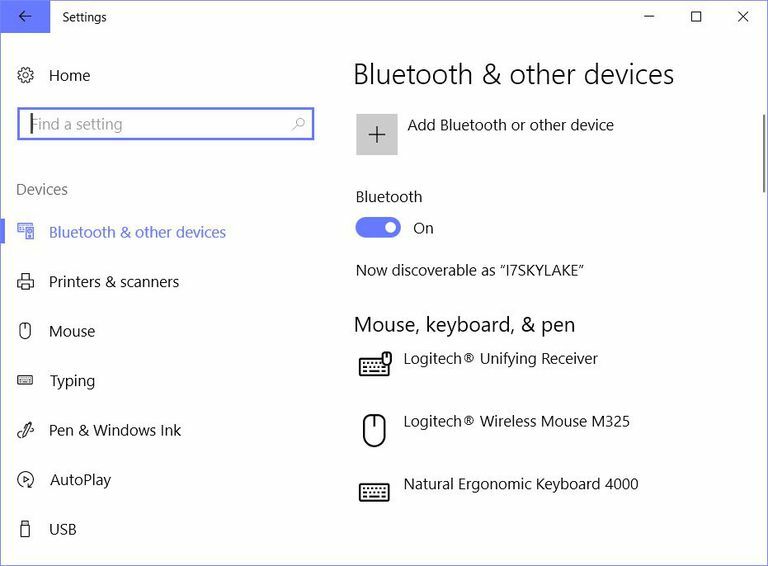 You can tell right away if a Windows 10 PC doesn't have Bluetooth installed. Instead of an entry that reads "Bluetooth On" you'll see only text that reads "Add Bluetooth or other device." This means the PC needs a Bluetooth radio, stat, so it can communicate with other Bluetooth devices. Fortunately, it's dead simple to add Bluetooth to PCs of all kinds. Then you can use Bluetooth computer speakers, Bluetooth mice, Bluetooth keyboards, or whatever else Bluetooth you might want to hook up to your PC. This compact USB device adds Bluetooth to a Windows PC. All you need to do to add Bluetooth to your Windows PC is to buy a USB Bluetooth adapter. Also known as a Bluetooth dongle, such devices are inexpensive, compact and easy to find. 2.0 ports show plain USB fork with black inserts, 3.0 forks SS with blue. If you look at your PC's USB ports and they've got black plastic inserts, they're probably USB 2.0. If the inserts or blue, or are labeled SS (for "SuperSpeed"), they're USB 3.0. This matters because while USB 3.0 devices work in USB 2.0 ports, they won't work as fast as when plugged into USB 3.0 ports. Generally speaking, you want to get the fastest Bluetooth radio/Bluetooth transmitter your PC will support. For most modern PCs that means a USB 3.0 adapter. Class 1 Bluetooth radios span 100 meters; higher-numbered classes span less. Bluetooth radios come in classes 1 through 4. Class 1 spans up to 100 meters (328 feet); Class 2 spans up to 10 meters (32.8 feet). Unless you're certain you'll always have your device and your PC in close proximity, don't bother buying Class 3 or Class 4 Bluetooth devices. Class 1 costs the most (around $20 USD) but also reaches furthest. That's what most people buy nowadays. The higher the Bluetooth version, the faster it goes. Bluetooth versions run from 1.0 to 4.1. Nobody buys 1.x versions anymore, but V2.1 remains popular because it supports the most devices. V3.0 and V4.X cost more, but also run faster. Be sure to buy from a vendor who'll let you return devices if they don't work with your Bluetooth peripherals. Then, start with V4.0 or V4.1 devices, and trade down if you must. You'll pay more for the speed and extra features that higher-numbered versions deliver, but for streaming media they're the best choice. Add a BT device: click +, pick the device, enter a PIN if prompted. In most cases, you need only plug your Bluetooth adapter into a Windows 10 PC. Plug 'n Play will install the driver automatically, and it will be ready to use. If that doesn't work, visit the device maker's website to download and install its driver. However, each of the four different adapters tried for this story came up and ran on its own. After that, you will want to click the plus sign in Settings → Devices (Bluetooth & other devices) that reads "Add Bluetooth or other device." This calls up a pairing window in which you can pick the Bluetooth device you'd like to add. Simply click that device (and enter a verification code if prompted) and presto! You've got Bluetooth connectivity. It doesn't get much easier than that! Usable Bluetooth devices say "Paired," Other Devices are up for grabs. Turn off the device, then turn it back on. Remove the Bluetooth adapter, reboot your PC, then reinsert. If none of that works, its time to turn to a self-help forum like www.tenforums.com or answers.microsoft.com for more assistance.